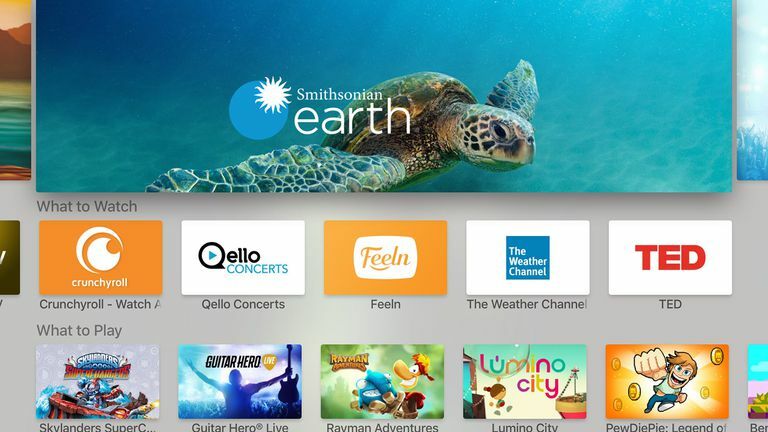 One of the best features of the 4th Generation Apple TV and Apple TV 4K is that you can now install your own apps and games using an iPhone-style App Store. Instead of being limited to "channels" approved by Apple and automatically installed on your Apple TV — which is how previous models worked — you can now choose from thousands of apps and games that provide new options for streaming video, listening to music, playing games, shopping, and more. If you've got an Apple TV and want to install apps on it, read on for step-by-step instructions and time-saving tips. Featured Apps: If you've used the App Store on the iPhone or in iTunes, the layout of this App Store will be familiar to you. The main screen includes a series of featured apps at the top and then collections of newly released apps, popular and top-selling apps, and apps selected by Apple for promotion. Use the remote to navigate this screen until you find the app you want to install. Top Charts: Select the Top Charts category in the menu across the top of the screen (if it's not displayed, swipe all the way up on the remote's touchpad). Once you do that, you can view apps in ways like most downloaded, biggest sellers, highest grossing, etc. Categories: Another of the options in the menu at the top of the screen. You can browse apps by categories like Games, Education, Lifestyle, and News. Search: The final option in the top-level menu. Select it and use the onscreen keyboard to type in the name or type of app you're looking for. Once you've found the app you're interested in, follow these steps to install it. Highlight the app and click the touchpad to view the detail screen for the app. On that screen, free apps display an Install button; paid apps display their price. Highlight the button and click the touchpad to begin the installation. You may be asked to enter your Apple ID password. If so, use the remote and the onscreen keyboard to do so. An icon appears on the button showing the progress of the installation. When the app is downloaded and installed, the button's label changes to Open. Either select that to start using the app or go to the Apple TV's home screen. You'll find the app installed there, ready to use. The process of installing apps on the Apple TV is pretty quick and pretty simple, except for one thing: entering your Apple ID password. That step can be really annoying because using the Apple TV's onscreen, one-letter-at-a-time keyboard is cumbersome and slow. While you can enter your password by voice or using the onscreen keyboard in the Remote app, you can skip that step entirely with this tip. Launch the Settings app on the Apple TV. On the Purchases and In-App Purchases screen, select Require Password. On the next screen, choose Never and you'll never again be asked to enter your Apple ID for any purchase. On the Purchases and In-App Purchases Screen, select Free Downloads and toggle it to No. With that done, your Apple ID password will never be required to install free apps, only for paid apps.